In this chapter, we briefly discuss the theoretical foundations of relativistic two-component methods used in quantum chemistry calculations. Specifically, we focus on two groups of methods. These are (i) methods based on the elimination of the small component, such as the zeroth-order regular approximation (ZORA), the first-order regular approximation (FORA), and the normalized elimination of small component (NESC) formalisms, and (ii) approaches that use a unitary transformation to decouple the electronic and positronic states such as the Douglas–Kroll–Hess (DKH) and the infinite-order two-component (IOTC) Hamiltonians. Furthermore, we describe the algebraic approach to IOTC and scrutinize pure algebraic schemes that paved the way to the eXact 2-Component (X2C) Hamiltonians taking advantage of the nonsymmetric algebraic Riccati equation (nARE). 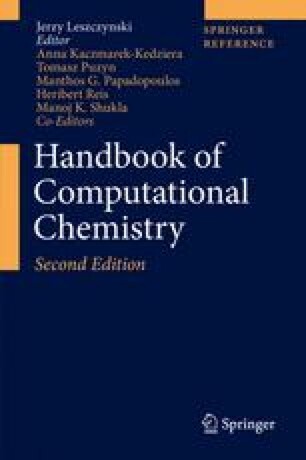 Finally, we assess the accuracy of the aforementioned methods in calculating core and valence properties of heavy-element compounds and discuss some challenging examples of computational actinide chemistry. We gratefully acknowledge the financial support from the National Science Center Poland, Grants No. DEC-2012/07/B/ST4/01347 and No. DEC-2013/11/B/ST4/00771. K.B. acknowledges financial support from a SONATA BIS grant of the National Science Centre, Poland (no. 2015/18/E/ST4/00584). We had many helpful discussions with Prof. Markus Reiher and Prof. Lucas Visscher.